BEND, OR -- A federal mediator joins contract negotiations, Thursday, between St. Charles Bend and its nurses. Local Bargaining Chair and Registered Nurse David Hilderbrand says he's not worked with a federal mediator in negotiations before, but the hospital says it's a common step in the process, "We'll spend less time face to face with the employer, and more time with that person being the go-between between the two negotiating parties." Nurses at the Bend hospital have been working without a contract since July. Hildebrand is optimistic a new neutral party will lead to results, "We're still hopeful that the employer will decide that a fair contract is advantageous for the community, and for the hospital, and for all its employees." 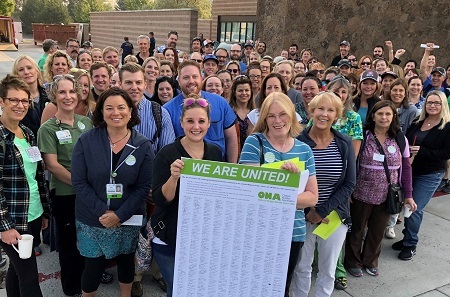 The nurses will he holding another rally Thursday morning, in the lobby of the Heart and Lung Center, near where the latest round of two-day contract talks are scheduled to take place. Hildebrand says the public is invited to join nurses at the rally, which begins at 8:30 a.m. "Any members of the community can just show up and show their support for the negotiating team and say, 'we're trying to get a fair contract that can make care safer at St. Charles'." Hildebrand tells KBND News, "If we can't reach a contract in mediation, I would say then our members have a decision to make whether or not they would like to withhold their labor as a strategy to getting the hospital to agree to something that is fair." He adds, "For the hospital side, it would be implementing their last, best, and final offer, which means that they would just force the nurses to work under the contract that they have proposed, and for the union side, it would mean a work stoppage or a strike."